Sal Cupertine is a legendary hit man for the Chicago Mafia, known for his ability to get in and out of a crime without a trace. Until now, that is. His first-ever mistake forces Sal to botch an assassination, killing three undercover FBI agents in the process. This puts too much heat on Sal, and he knows this botched job will be his death sentence to the Mafia. So he agrees to their radical idea to save his own skin. A few surgeries and some intensive training later, and Sal Cupertine is gone, disappeared into the identity of Rabbi David Cohen. Leading his growing congregation in Las Vegas, overseeing the population and the temple and the new cemetery, Rabbi Cohen feels his wicked past slipping away from him, surprising even himself as he spouts quotes from the Torah or the Old Testament. Yet, as it turns out, the Mafia isn't quite done with him yet. Soon the new cemetery is being used as both a money and body-laundering scheme for the Chicago family. And that rogue FBI agent on his trail, seeking vengeance for the murder of his three fellow agents, isn't going to let Sal fade so easily into the desert. 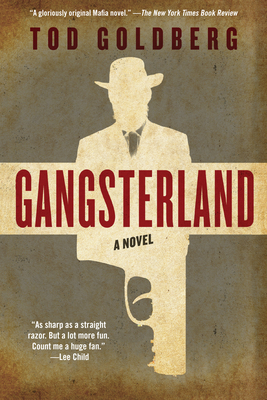 Gangsterland is the wickedly dark and funny new novel by a writer at the height of his power - a morality tale set in a desert landscape as ruthless and barren as those who inhabit it. Tod Goldberg is the author of the crime-tinged novels Living Dead Girl, a finalist for the Los Angeles Times Book Prize, Fake Liar Cheat, and the popular Burn Notice series. His essay "When They Let Them Bleed" first published in Hobart was selected by Cheryl Strayed for inclusion in Best American Essays 2013. He is also the author of the story collections Simplify, a 2006 finalist for the SCIBA Award for Fiction and winner of the Other Voices Short Story Collection Prize, and Other Resort Cities. His short fiction has appeared in numerous journals and anthologies, twice receiving Special Mention for the Pushcart Prize as well as being named a Distinguished Story of the Year in the 2009 Best American Mystery Stories. His essays, journalism, and criticism appear regularly in many publications, including the Los Angeles Times, Chicago Tribune, and Las Vegas CityLife and have been featured in Salon, Wall Street Journal, E!, and Jewcy among many others.